Today’s briefing highlighted the positive aspects of migration both for the host countries as well as for the countries from which the migrants come. The panel was composed of United Nations experts, and partners from NGOs working with migrants, as well as some living the migrant reality. Ashraf El Nour, Director of the International Organization for Migration (IOM)’s office to the United Nations in NY, moderated the session. In addition, he leads IOM New York policy development work in the Global Compact on Safe, Orderly, and Regular Migration. I found “Regular” to be an odd word choice, but now realize that it differentiates those migrants that arrive in a host country illegally or overstay tourist visas, etc., and thus are “Irregular” migrants. Regular migrants are registered in a host country and have access to legal employment, better wages, legal protections, more social services, and are less vulnerable to the abuses that migrant workers may suffer. In 2017 the number of international migrants worldwide was nearly 258 million. About 3.4% of the world population are international migrants (this compares to 2.8% in 2000). Given global trends that can necessitate people movement: war and family safety, climate change, natural disasters, economic factors, the trend will continue to increase …and this is a good thing. Migrant workers contribute over $6 trillion to global GDP. They contribute to economic growth, development and innovation, combat the negative economic effects of aging populations in some host countries, enrich society with new foods, music and cultural aspects. And the remittances sent home by migrant workers, over $413 billion in 2016, can enable families and villages to survive and improve living standards. Maria del Carmen Dominguez, Deputy Permanent Representative at the Permanent Mission of Chile to the UN spoke about Chile’s experience and policies. The birth rate in Chile is 1.9 children per woman – thus the population is now aging and Chile needs migrant workers. Most migrants in Chile are from other Latin American countries and the Caribbean. The unskilled migrants can fill jobs in agriculture, logging, and other industries that are important exports for Chile. Many unskilled migrants are quick to become more skilled workers when given the training and education. Chile has both “Regular” and “Irregular” migrants and it has a process to make the “Irregulars” “Regular”. Bela Hovy, Chief of the Migration Section at the United Nations Department of Economic and Social Affairs, overseas the estimation of global migration trends and supports migration data collection and analysis in developing countries. From 1993 to 2005, Mr. Hovy was responsible for statistics at the Office of the UN High Commission for Refugees (UNHCR) in Geneva. And statistics he did provide – on levels and trends in international migration, demographic characteristics, migrant remittances and more. In many parts of the world, migration occurs primarily between countries within the same region: most international migrants in Asia (80%), Africa (79%), Latin America and the Caribbean (64%), and Europe (53%) originate from another country in the same region. By contrast most international migrants living in Northern America (98%) and Oceania (87%) were born in a region other than the one they are residing in. The ratification of legal instruments related to international migration is uneven. The 1951 Refuge Convention and its 1967 Protocol have been ratified by 145 and 146 UN Member states, respectively. But only a quarter of countries have ratified the 1990 International Convention on the Protection of the Rights of Migrant Workers and Members of their Families. Kevin Appleby is Senior Director for International Migration Policy for the Center for Migration Studies of New York and the Scalabrini International Migration Network (SIMN). SIMN is a network of 270 schools, shelters, educational institutes and training and community centers for migrants operated globally by the Missionaries of St. Charles, Scalabrini, Catholic religious order. He focused on the importance of a regularization program to legal status. He also mentioned studies that show if 11 million undocumented workers were regularized, it would increase the real GDP in the USA by 3.3% over 10 years. Manal Kahi is the founder and CEO of Eat Offbeat, a social enterprise that delivers authentic meals made by refugees to clients (mainly corporate). Manal came to the USA to pursue a career in international affairs, but found the hummus available in NYC led her to launch Eat Offbeat. The enterprise both helps New Yorkers to discover authentic dishes from around the world and also creates quality jobs for immigrants. Manyang Reath Keer spent almost 14 years of his childhood as a Lost Boy of Sudan before he was brought to the USA by a faith based NGO. For the past 10 years, in addition to getting an education, he has dedicated his life to raising awareness and money for the refugee crisis through his non-profit, Humanity Helping Sudan and most recently he launched a coffee Brand, 734, named for the geographical coordinates for Gambela, a region in Ethiopia where over 200,000 South Sudanese citizens take refuge. Precedes support farming enterprises in the region and allow refugees to live a more meaningful and aid-free life. Article written by UN Representative Mary Brophy. And today – on Equal Pay Day – we’re redoubling our efforts in the fight for equal pay for equal work. We need to unstack the deck for women across our city. It’s the right and the smart thing to do. 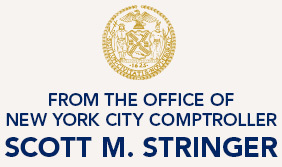 Copyright © 2018 New York City Comptroller’s Office, All rights reserved. 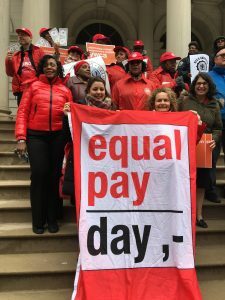 NFBPWC-NYC has been a key leader on this issue in New York, working closely on the New York City ban already in effect, and advocating for a state-level ban as part of our testimony at the State Department of Labor gender pay gap hearings last summer. The DOL’s press release and pay gap report, released this morning, can be found here. We also participated at today’s Equal Pay Day Rally on the steps of City Hall with our other partners. Below are some twitter sites to visit to tweet about this Governor Cuomo’s bill and the unfair and discriminatory employment practices against women being paid their value. Join NFBPWC-NYC, The Zonta Club of NY, and the New York Public Library 53rd Street for the second annual 50/50 Day on April 26, 2018, and the greater #GettingTo5050 Movement. There are already over 20,000 events signed up in companies, schools, classrooms, museums, and homes around the globe to work toward getting to a more gender-balanced world that’s better for everyone across all parts of society, from the economy and politics to culture and home. We will see short engaging films. We can take action pledges, participate in discussions, and hear part of what is a full day of live-streamed programming featuring speakers, live events, and more. Equal Pay Day (April 10) will have passed, and we can see how far we need to act to reach equal pay, let’s celebrate how far we have come, and what we need to do to keep up the momentum to create a just and equitable society. The first annual 50/50 Day had over 500 million press impressions, a billboard in Times Square, and ABC News, NPR, Variety, Bloomberg, Time Magazine all covered the event. Please RSVP to this free event by 4/25/18 at noon to be placed on the attendee list. The UN Department of Public Information has undertaken a campaign to build support for the service and sacrifices made by United Nations’ Peacekeepers. Peacekeeping operations began in 1948 and since then there have been 71 missions. There are currently 105,187 personnel working in 15 peacekeeping operations around the world. Each peacekeeping operation is unique and its mission is defined by a mandate from the United Nations. The peacekeeping forces are contributed by the member nations and at present 123 different countries are contributing uniformed personnel to the peacekeeping missions. The peacekeeping operation is not an army, or a counter-terrorist force, or a humanitarian agency. It is a tool to create the space for a nationally-owned political solution. The peacekeepers do assume a variety of roles that can include protecting the civilian population, monitoring a situation, ensuring that aid is received, disarming and serving as role models. Over 3,500 peacekeepers have lost their lives on mission. 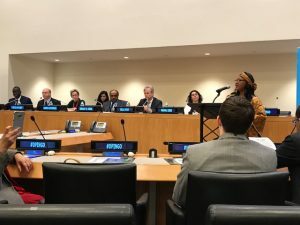 The panel was moderated by Hawa Diallo, currently a Public Information Officer at DPI, but she has also served in two United Nations Peacekeeping Operations in Cambodia and Somalia. Brigadier General Khan Firoz Ahmed, Defense Advisor, Permanent Mission of Bangladesh to the United Nations. Bangladesh is the 2nd largest troops contributing country to the UN. The General spoke of the UN values of Integrity, Professionalism, and Respect for Diversity that are part of every UN mission and how the peacekeepers are trained both in their home countries and again once they are part of a mission. John Greenway, Strategic Communications Officer, DPI. Mr. Greenway manages communications campaigns and crisis communication and spoke about this campaign and showed two short films featuring specific peacekeepers on missions now. Both were very moving in their humanity and showed the risks these people undertake. Charles Anyidoho, Senior Political Affairs Officer at Europe Division of the Department of Political Affairs. Every member of the panel had significant experience in the field and spoke about that experience – including their fears and the rewards of being part of history when a mission accomplishes its goals or at least some of the goals – which can seem like a miracle – and the impact their work can have on the local population. The missions of the peacekeepers are crucial to the peace and security of our politically charged world and recognizing the contributions and sacrifices of these individuals is important. Ms. Connors’ position is significant in that it is newly created, adding strength to Antonio Guterres commitment to protecting the rights and dignity of victims as he works to address sexual exploitation and abuse in the United Nations’ system world-wide. The new office also puts another woman in a position of leadership at the United Nations, reaching gender parity at the senior level – 22 men and 22 women. Ms. Connors’ background as an attorney and educator combined with years of experience as the Director of International Advocacy for Amnesty International and various positions at the United Nations make her a very good choice for this office. In 2017 there were 54 allegations of abuse made against UN workers. The Un has a strict “No excuses, zero tolerance approach to UN personnel. Ms. Connors’ position is to put the rights and dignity of the victims at the forefront. She wants to focus on victims’ care and follow-up – including medical care and other types of support and advocacy. Prevention is also a priority. She wants to be sure that there is communication in the local community so that victims know what to expect should abuse or exploitation occur. At the field level, the UN is seeing progress in its desire for transparency and refusal to take a defensive stand. The rule is “ Do not harm” and there is zero tolerance. There are challenges ahead as allegations of abuse made against UN workers mirror this situation world wide, where positions of inequality and a vulnerable population make exploitation possible.